The last time I used an ice-tray was from my mini fridge in my college dorm room…that was in the early 1990’s. Most Millennials don’t even know what an ice-tray is, and my 10 year old daughter has never even heard of an ice-tray. Why would she need one when you just push the button on the door and ice comes out. However, just about everyone has made homemade popsicles. They are fun to make, inexpensive, and are virtually limitless in flavors. Just Google “homemade popsicle” and you get almost 24 million results. Unfortunately, the water used in ice-trays and popsicles share the same physical properties as the water in your backflow preventer. When water freezes, it expands in size by roughly 9% of its original volume. This makes the cubes stay in the ice-tray, the stick stay in the popsicle, and the internals of your backflow preventer warp and break. Pictured here are some real life frozen backflow preventers. 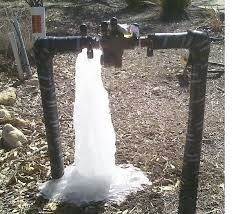 As you can see, expanding frozen water inside a backflow preventer causes all kinds of problems. It can freeze the internal checks causing them to break or malfunction. 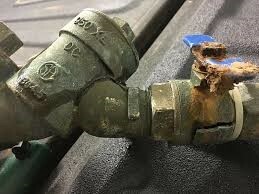 It can damage the relief valve which allows water to escape the valve and cover the surrounding area with ice, or it can simply warp the bronze, cast iron, or stainless steel body which prevents the internal parts from seating correctly. Sometimes frozen backflow preventers are very obvious and you immediately know the problem and how to fix it. 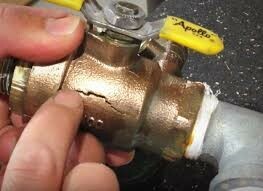 You may find broken ball valves, ruptured sensing lines and cracked valve bodies which are easily diagnosed. 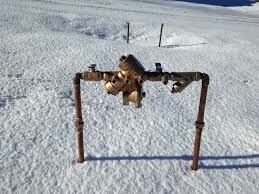 However, sometimes the effects of frozen backflow preventers are not known for extended periods of time. 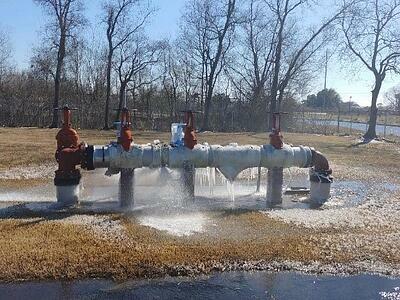 Double Check backflow preventers, which do not have a relief valve to signal when something is wrong, can freeze in the winter and provide zero backflow protection until a certified tester discovers the problem during their routine testing. This could be up to a year - or more depending on the enforcement of the municipalities’ backflow testing program - of no protection for your drinking water supply. Frozen backflow preventers are scary. The good news is there are several ways to protect your backflow preventer from becoming a popsicle flavor you do NOT want to try. This valve obviously needs to be protected by an ASSE 1060 enclosure…but it will first need to be replaced! An ASSE 1060 enclosure with the correct heater will provide your backflow preventer with a warm and toasty environment, even if the outside temperature is -30 degrees. We don’t often see -30 degrees in the contiguous United States, but in upper Alaska and Canada, where some of our backflow enclosures are installed, -30 is not uncommon. Even in those extreme conditions and temperatures, the backflow preventers installed inside the enclosures are still protected in a cozy 40 degree environment. 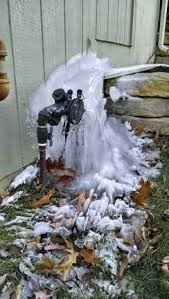 If there is no water in your backflow preventer or irrigation system, it will not freeze and expand. Consult your local irrigation contractor to professionally winterize your irrigation system. This detailed process will remove all water from the entire system, and sometimes even removes the backflow preventer as the system is shut-off for the winter. Just remember to re-install the backflow preventer each year as irrigation chemicals are some of the worst contaminants for the water supply. As I travel across the country, I often hear that “we live in a warm climate so we don’t need freeze protection for our backflows.” This is simply not accurate, and most of these people have replaced numerous backflow preventers throughout their system at great costs to the municipalities and/or customers. With deep freezes over the past few years in Miami, Houston, and even Phoenix, there are no areas in the US that don’t need freeze protection. The physics of water are constant, whether inside a delicious popsicle, or inside a life-saving device like a backflow preventer. Unfortunately, backflow preventers have precise and integral components that can be easily damaged by the forces of frozen water. Be prepared to protect your backflow preventers when the temperature drops below 32 degrees…or be prepared to repair and replace all the valves in your system.